Eat Oreo Launches Two New Flavors: Cookie Dough and "Marshmallow Crispy"
Oreo Launches Two New Flavors: Cookie Dough and "Marshmallow Crispy"
How will they compare to Double Stuf Oreos!? Oreo has launched two brand-new flavors: cookie dough and then something called “marshmallow crispy,” which is clearly based on a Rice Krispies Treat. 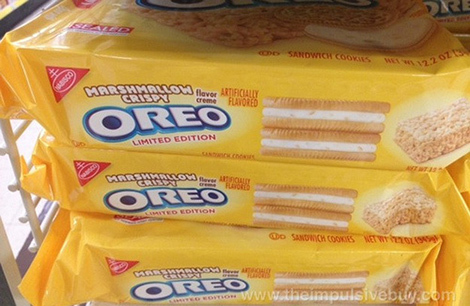 Both Oreo varieties will hit shelves on Feb. 3 for a limited time only. In other news, the exact opposite of the Marshmallow Crispy Oreo product also exists in the Universe: Kraft features a recipe for Rice Krispies Treats with Oreos in them. We think both Oreo flavors sound sub-par to the O.G. Oreo, which in our opinion can not be beat. Either way, we’re down to try ’em. Regardless, you’ll be able to find both cookie dough and marshmallow crispy Oreos at most grocery stores, along with Walmart and Target. They’re expected to last for about six to eight weeks.